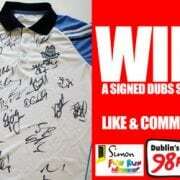 Ahead of the 2016 All-Ireland Football final on Sunday, 18 September, the Dublin Simon Community are giving away a signed Dublin GAA jersey. 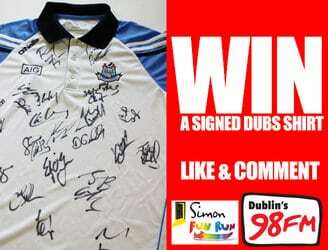 To encourage sign ups to their vital fundraiser, the Simon Fun Run, the homeless charity are offering Dublin fans the chance to get their hands on an official signed jersey with autographs from all of the panel including star men like Bernard Brogan and Diarmuid Connolly. To be in with a chance to win, register for the Simon Fun Run at funrun.ie to be entered into the draw. The charity are calling on all Dublin fans to support this vital fundraising event to help in the fight against homeless in the city. Former Dublin GAA dual star Conal Keaney is getting behind the Fun Run and encouraged Dublin fans to sign up. “It’s a great day out for both serious athletes and families just looking for a fun weekend. Most importantly it’s a fantastic way to raise vital funds for the Dublin Simon Community and help people experiencing homelessness. The competition is being run in partnership with our media sponsors, 98FM, and entry couldn’t be easier. To enter all you have to do is register for the 2016 Simon Fun Run, which takes place on Saturday, 1 October in the Phoenix Park from 10am. Once you register for the Simon Fun Run through the Dublin Simon Community website, then you will automatically be entered into the draw for the signed jersey. The winner of the competition will be announced at the end of the Simon Fun Run, so make sure to mark it in your diary and stick around after the race. Keep an eye on the Dublin Simon Community and 98FM Facebook and Twitter accounts for further details on this fantastic prize. Finally, the Dublin Simon Community would like to take this opportunity to wish Jim Gavin and all of the Dublin players the very best of luck in the All-Ireland replay against Mayo on Saturday, 1 Ocobter.